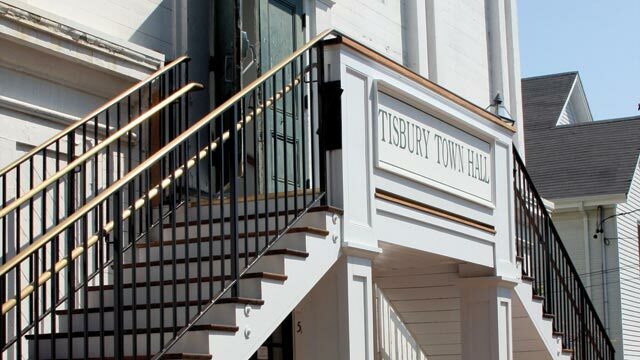 Tisbury expects to save about $1.3 million over 20 years, or about $65,000 annually in municipal energy costs, under a power purchase agreement and solar project development venture with the Cape and Vineyard Electric Cooperative (CVEC). CVEC board clerk and Cape Light Compact (CLC) administrator Margaret Downey presented details of the project and draft documents at the selectmen’s Tuesday, where selectmen approved the initiative. She said the agreements would establish a fixed price for electricity at 8.5 cents per kilowatt-hour for 20 years. Tisbury and Edgartown are two of seven CVEC member towns on Martha’s Vineyard and Cape Cod where the cooperative will install solar PV systems. CVEC awarded its project to American Capital Energy (ACE) in April. ACE chief financial officer Art Hennessey, director of business development Bill Fitzpatrick, and senior project engineer Eric McLean attended Tuesday’s meeting with Ms. Downey. Tisbury plans its solar array to be constructed on the town’s capped landfill near the Park and Ride lot off State Road. Mr. McLean said Tisbury’s solar PV system would generate about 1.065 megawatts of power. Although construction takes about three months, he estimated with time allowed for design and permitting, the project would be complete by December 2012. Mr. Hennessey said ACE will hire local contractors. 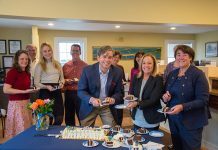 CVEC works in concert with CLC, a public regional energy services organization that works with the combined buying power of 200,000 energy consumers in all 21 Cape and Island towns. The cooperative formed in 2007 to help member towns create new sustainable energy sources, enable them to own electricity-producing systems, and sell the energy. The project developer will recoup its costs in part through lucrative federal and state energy incentives, and by selling energy credits to Massachusetts utilities, which must certify that at least five percent of the energy they distribute comes from renewable resources.While the cost savings to local taxpayers is enormous, and although the facilities will produce clean energy, projects like these are coming under increasing scrutiny for the large government subsidies, the profits they could generate for private developers, and the costs passed on to other consumers. In other business, during the three-hour meeting, the selectmen agreed to give temporary construction site supervisor Dennis Mason of Seaver Construction two more weeks to demonstrate his ability to manage the town’s emergency services facility (ESF) project before they decide whether to accept his paticipation long-term. Building committee chairman Joe Tierney said evaluations he received from the owner’s project manager (OPM) and HKT architects a few weeks ago expressed reservations about Mr. Mason. But, since then, reports have been better. Mr. Tierney said the building committee had not yet discussed the evaluations with Seaver Construction management. In follow-up to discussion last month, the selectmen approved spending about $1,600 to contract for a revised harbor dredge plan by the Woods Hole Group, as suggested by Nevin Sayre and the town’s harbor dredge committee. Mr. Sayre said he and a group of fellow homeowners are willing to share with the town the cost of redistributing sand from the dredge project to the Grove Avenue beach near their neighborhood. According to information Mr. Sayre received from state officials, he said the revised dredge plan is necessary to address permitting requirements, particularly in regard to eelgrass in the harbor. Harbormaster Jay Wilbur said the dredging should be done next winter. Under town department reports, police Chief Daniel Hanavan announced that downtown Vineyard Haven is off-limits to skateboarding because of safety concerns, particularly on Main, Union and Water Streets. He also recommended the appointment of seven traffic officers, which the selectmen approved. The selectmen also revisited a request from the town’s housing committee that Tisbury contribute $4,000 toward an Island-wide housing needs assessment study. They postponed taking action a few weeks ago and invited Martha’s Vineyard Commission (MVC) planner Christine Flynn to their meeting Tuesday night to discuss the study. Ms. Flynn said data on Martha’s Vineyard’s affordable housing needs updating, a critical requirement for applying for state and federal grants. She explained that the Island’s Joint Affordable Housing Committee (JAHC), which meets under the auspices of the MVC but is not part of the commission, proposed the study. The JAHC requested that the towns split the $30,000 cost of hiring a private consultant to do the study with funds from their municipal affordable housing trusts. Ms. Flynn said the MVC originally committed $6,000 toward the study but was asked by Edgartown to find additional funds. In response, the MVC agreed to contribute an additional $1,800, and the Martha’s Vineyard Housing Fund $6,000. Ms. Flynn said that would lower each towns’ share to $2,700, assuming all participate. However, last week the Edgartown selectmen voted not to fund the study. They said the MVC, as the Island’s regional planning agency, should conduct and fund it. Although the Tisbury selectmen agreed the study is important, they sided with their Edgartown counterparts. They voted to take no action and to send a letter to the MVC, asking the commission to take on and fund the study. Following a public hearing at 5:30 pm, the selectmen granted a fuel storage license to Jay McMann of Island Fuel. There was no public comment. Mr. McMann plans to store up to 9,980 gallons of heating oil at the above ground storage site located at 44 Evelyn Way. The selectmen also approved a permit for Mr. McMann to deliver fuel to commercial fishing boats at the Lake Street landing at Lake Tashmoo. To address harbormaster Jay Wilbur’s concerns about erosion around the bulkhead, the selectmen added a condition to Mr. McMann’s permit that requires him to park 25 feet away, on the pavement. During their discussion session, the selectmen interviewed several candidates for the Tashmoo management committee. They took no action on appointments at their last meeting, because Mr. Kristal said he wanted to get some new blood on the committee. He also expressed reservations about reappointing long-time committee member Lynne Fraker, because of her clashes with other committee members and harbormaster Jay Wilbur. Mr. Israel, however, made a motion to reappoint Ms. Fraker, with a warning to her to keep her discussion at committee meetings about Lake Tashmoo issues and not about personalities. Mr. Kristal and Mr. Coogan refused to second his motion. Both said they had received complaints from other committee members about Ms. Fraker’s behavior at meetings. Although Mr. Israel proposed to reappoint Ms. Fraker, he took note of complaints he received about her, too. Ms. Fraker objected at length to the selectmen’s decision. The selectmen voted to appoint Michael Jampel and William O’Connell. They praised Ms. Fraker for her work on the harbor dredge committee and encouraged her to continue her efforts there. Instead, she immediately offered her resignation. The selectmen asked her to reconsider. “I’m done,” Ms. Fraker said. Previous articleWhy do roosters crow?